Affle, a Singapore-headquartered mobile media start-up, is all set to launch its instant messenger app Pinch in India. This is the second product of the company, scheduled to be launched in June this year. Incidentally, SMS2.0, a text messaging app that offers customisation of your inbox and messages, was launched in 2007. Pinch is an instant messaging (chat) app which will be available across various platforms â€“ iPhone, iPad, BlackBerry, Android, Symbian, Windows Mobile, the Web and even Facebook. Again, the app's pull is the level of tweaking it allows with emoticons, picture messages, animations and wallpapers. But it also has iLocation Sense, with which users can view maps, search for nearby users and update their locations as well. "India is an important market for us. Messaging has evolved in the country and advertisers have keen interest in our new products. We expect that Pinch will reach 100 million people within one month of its launch," said Anuj Kumar, CEO of Affle, while speaking to Techcircle.in. That is an ambitious target, considering that the company has reached 4.5 million users today via ads, products and services. But Affle has faith in its solid carrier partnerships. Over the years, it has built up partnerships with top telcos like Bharti Airtel, Idea Cellular, Reliance Communications and Tata Teleservices who will promote and market the app to their subscribers. Affle's m-coupon service, Coufon, will be integrated with Pinch in the next stage. According to Kumar, the company is planning to partner with daily deal sites in India to power the service. Coufon provides discounts and deals to mobile users, and offers campaign management and targeting services to deal sites and advertisers. "As compared to ad networks, our advantage is that we own the users and this is helping us. Our average sell-through rate on SMS2.0 is 75 per cent-80 per cent," says Kumar. SMS2.0 is monetised with ads and promotions, and Kumar says that the advertisement traffic has been quite encouraging. In fact, SMS2.0 now witnesses 150-170 million page views per month. And in 2011, Affle has also witnessed 12 per cent-15 per cent rise in content consumption on a monthly basis. Advertisers are also taking the mobile medium more seriously this year. "The mobile advertising market is still in a nascent stage, but we have been in this industry for five years now and have seen a change in the advertisers' mindset. In the early days, there was more experimentation and pilots. Now, the top 10 advertisers are signing annual deals and are no longer thinking of mobile advertising as an experiment. They have made it a recurring part of their investments." Rollout of 3G networks in India has also helped in attracting marketers. "Advertisers feel 3G is great and advertisements will no longer be considered intrusive. With 3G, there will be more smartphones, leading to more content consumption, which will create more opportunities for advertisers," he comments. On challenges related to mobile payment, Kumar says, "We have looked closely at the evolving trends in m-payment. The integration of payments with mobile bills seems to work well. The amount is either added to a user's post-paid bill or deducted from his/her pre-paid account. It has really helped smoothen the payment process." The company's largest investments are in India and Indonesia, where it is growing its sales teams aggressively while product development is centred in Singapore alone. "In one year, we have doubled our teams and my mandate is to add people in India. We are also strengthening our carrier relationships in India and Indonesia," says Kumar. 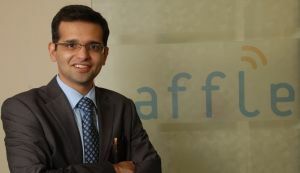 Affle is also eyeing newer geographies such as the USA, Western Europe and Australia for expansion. Besides, the company is considering a global launch of its products this year, as opposed to the local launches in partnership with cellular operators and the ecosystem. "The barriers of distribution have fallen, thanks to the app stores. So, we plan to launch our products globally," details Kumar. Affle is hoping to raise a fresh round of investments this year from existing and new investors. This would be its third round of institutional funding. So far, the company has been backed by technology companies and media houses, rather than private equity or venture capital investors. Microsoft Corporation, Itochu Corporation of Japan, Bennett, Coleman & Co. Ltd (BCCL), Centurion Private Equity and D2 Communications have stakes in Affle. However, Kumar did not divulge the details of the amount, raised so far by the start-up. "We are probably one of the few start-ups who had never raised funds from a VC. But there is a lot of interest in this space today and you may see the entry of VCs in the next round," he shared. Funds will be used for expansion, but acquisition is not a top priority. However, an acquisition in new geographies may help back up its global launch, agrees Kumar. In addition to messaging and social networking, the other big driver for Affle's growth is sports. The company launched Cricket Maharathi in 2010 and followed it up with a mobile magazine called Dressing Room, which featured content on off-field cricket action. Dressing Room claims to receive daily page views of 300,000. Now, Affle will launch more products in the sports category. "We will see more action around sports category. We think it is still not fully exploited and there is a latent demand from consumers," concludes Kumar.